A few months ago, I wrote a review of an HTML-editor ported from Windows: CoffeeCup. I found a quite a few bugs in that version, and don't actually know if a new one has been made available for Linux. I know that new Windows versions has been poping up regularly. So the search has been going on for a reliable and powerful HTML editor in which I can do all my HTML page construction. I can say I've found a good candidate for such a beast. It isn't Homesite--but then, it is isn't finished yet. Bluefish is in version 0.3.4 as of this writing (early June 2000). So according to version number it is very early yet, but it is still a quite powerful editor. As can be seen from the picture, it has all the button rows, tabs and menues one could ask for. The standard button row is for creating a new document, opening, saving, undo/redo, etc. All standard stuff. Then we've got a series of tabs which are generally well laid out but unfortunately not configurable at this time. Unfortunate, because the quick bar is supposed to contain the most used tags - but lacks the Heading tags, which are on the Fonts tab. While, structurally logical, it is not user-friendly. While I'm on about weird thing about the tabs, I'll mention an irritating bug that's been around for some versions: the Form wizard. It's long, very, very long. I have to scroll horizontally two screenfuls to find the close button. And while the other Wizards are pretty useful (New Page, Font, Tables, Frames, Lists, CSS, PHP, etc. 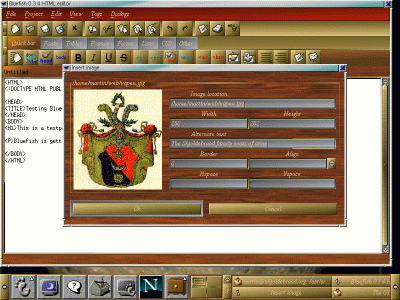 ), the Forms wizard is broken and should be avoided. Even if it were working, it creates only the opening and closing tags. While the button rows and wizards are good, you can also add tags using the menus. These are well laid out, and I believe they contain tags not available through the buttons and wizards. Another bug which has surfaced in this version is that the cursor disappears from time to time, making it hard to know exactly where you are in the text. Regarding about menus, I can't say much about the help system. There isn't one, at least not in the version I am running (there was one earlier?). Even though that may be a disappointment, I didn't miss it much. One thing that is missing is Imlib support, which is necessary for the Image wizard. Imlib isn't installed standard on Red Hat. Without that you have to write you own image tags. Which is a pain. (Not as bad as writing your own table tags, but still a pain). Fortunately, you just install it off the CD and then you may happily create images in you HTML documents in no time. To summarize, Bluefish is a very strong HTML editor, with nice looks as well. It will be interesting to see where this one is going. It is not Homesite (the well known Allaire editor for Windows) but it might get there.